"[I learned] how to make apps, that not all computer people are geeks [and that] you can have fun while doing something to further your education." - Technovation Challenge alumni. I grew up in a small city in India called Meerut and went to an all-girls convent school. I was a very close witness to the lemming-like drive to either become a doctor or an engineer. Out of my high school class of 80 girls, 40 took after school tuition classes to prepare for medical school entrance exams, 30 took classes to prepare for the IIT-JEE (Indian Institute of Technology, Joint Entrance Exams), some confused souls prepared for both, some recognized their aptitudes -- or lack thereof - and pursued home economics or English, and then the remaining one or two did what they liked. I did what I liked and went on to study Physics. India is a poor country and there's a very clear sense of purpose that you have to pursue careers in the hard sciences if you are to rise above poverty. This drive overrides all biases that children may have about their abilities to be successful in science and engineering. And so you see after school tuition centers packed to capacity with future engineers and doctors. There are some cons. Namely, that children do not pursue what they are truly interested in and there is some degree of dullness in being in an environment where everyone is pursuing exactly the same goals. Sometimes, because of the forced fit, children end up being very depressed and demoralized when they successful. I personally know students who have spent four or five years of their lives sitting at home, diligently preparing for these entrance exams, and failing each year. Such periods can be very scarring. However, there are some powerful pros, too! Children grow up with a "growth mindset". Science and math are accessible to all and most benefit from the rigorous, technical training. You get a nation of young people who believe they can do anything if they work hard enough. The nation builds layer upon layer of scientists, engineers and doctors who are able to take on and solve some of the most pressing, challenging problems that the world faces today. When I came to the United States, I was shocked to see that this "growth mindset" wasn't as prevalent. Children, students, adults seemed to take pride in saying "I don't do math" or "I don't get science". This was especially common among girls. I decided to do something about it and started a science-education nonprofit called Iridescent. Our mission is to use science, technology and engineering to develop persistent curiosity and to show that knowledge is empowering. One of our core programs is The Technovation Challenge. The focus of the program is real world computer science and entrepreneurship. High school girls are mentored by professional women from high-tech companies and together the teams develop mobile phone applications using a visual programming language called Google App Inventor for Android. 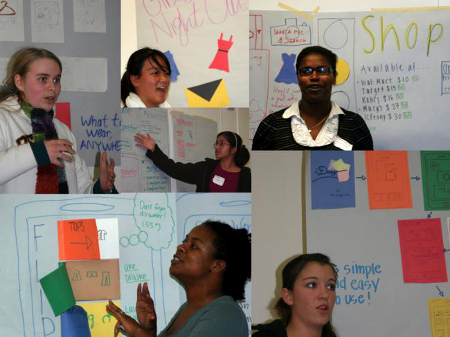 At the end of the nine-week course, the girls pitch their prototypes and plans for taking them to market to a panel of Venture Capitalists at a high-visibility "Pitch Night" event. 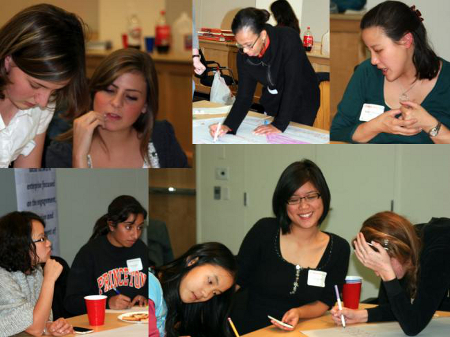 Our first Technovation Challenge was held last spring and partnered 45 girls with 25 mentors. Click here for a short video about the program. The goal of this program is to encourage girls to become inventors, builders and designers and not just technology users. We spent some time researching existing programs, challenges and compiling best practices and here is a brief overview of what we learned. "Upon entering college, females are faced with many more men who seem to have more experience and get better scores effortlessly. As a result, they start to doubt their ability to learn computer science. They begin thinking that learning computer science takes innate talent and no amount of hard work will pay off... The way lectures are presented seem to appeal to men more. In general, females feel that the birds-eye view of a problem and the end result is more relevant than the coding details in between" - Ting-Chih Shih, an undergraduate woma at the School of Computer Science in Carnegie Mellon University) and council member (Blum 2001). Research findings suggest that if we aim to broaden participation in technology, then we should emphasize diverse interests and backgrounds, the rewards of authorship, introduce technology via its social purpose and include concerns about the unintended consequences of new technology (Brunner, Bennett et al. 1998; Brunner and Bennett 2002; Brunner 2008; Brunner 2008). Another implication from gender research takes into account role models and their career stories. Women role models need to acknowledge the complexities of balancing multiple roles and responsibilities. They should share these personal accounts and stories of struggle instead of only focusing on the professional story. In doing so they show girls that proficiency in these fields is an acquirable rather than innate skill (Dweck 2007). Allowing participants to explore a broad range of problems from the start. Each year we pose a challenge for the teams to solve. The challenge strikes a balance between being complex enough to allow everyone to engage their prior knowledge and interests and feasible enough so that the teams can create working prototypes in nine weeks (Turbak and Berg 2002; Pezalla-Granlund, Rusk et al. 2005; Resnick 2005; Resnick and Silverman 2005; Bers 2007). We avoid the "pink software trap" that draws upon stereotypical images of women and femininity as it limits the pool since few girls actually fit such stereotypes and consequently do not feel targeted by the initiatives (Berg 2004). Learning from the MIT Media Lifelong Kindergarten Group, we create short videos explaining the challenge, providing ideas and inspiration, sample solutions and good examples of engineering and design (Resnick 2005; Rusk, Resnick et al. 2007). Increasing minority girls' access to social capital by helping them interact and build relationships with women university students as well as women faculty and professionals. Through these close interactions with women mentors and role models, girls learn more about pursuing STEM academic degrees and careers and potentially perceive these paths as being more accessible (Lareau 2003; Berg 2004; Halpern, Aronson et al. 2007; Gras-Velazquez, Joyce et al. 2009; Plant, Baylor et al. 2009). Anchoring learning through real world challenges and real world deliverables so that participants can see the immediate relevance of their learning (Dede 2009). Students are given opportunities to develop their leadership skills, make important decisions that affect the team and take on real responsibilities such as pitching a business plan to market a product (Melchior, Cohen et al. 2005). In addition students learn about real world resource constraints and trade-offs such as when deciding between favoring usability or aesthetics (Turbak and Berg 2002; Resnick 2005). Creating a growth mindset environment so that girls are more likely to believe that computer programming is an acquirable skill that can be improved with practice (Good, Aronson et al. 2003; Dweck 2007; Halpern, Aronson et al. 2007; Good, Rattan et al. 2009). The Technovation Challenge provides multiple ways in which girls can have greater confidence in their ability to succeed in STEM (Hewitt 1997; Goode, Estrella et al. 2006). The program also enables girls to deepen their programming skills and decrease the feeling of being misfits in a male-dominated environment (Margolis and Fisher 2002; Singh, Allen et al. 2007). Providing an environment structured for group programming to broaden classroom participation, to prepare students for working in the real, knowledge-based world and to show that programmers do not necessarily work in isolation (Resnick 2002; Karoly and Panis 2004; Williams 2006). Providing a structured path from a woman-only, woman-centered, safe, learning space to high-visibility technical presentation events. The Technovation Challenge sessions are only open to women participants so that they can safely step out of their comfort zones and address learning biases and learn new skills (Faulkner 2004). In addition we facilitate informal socials and other opportunities for the students and adults to build relationship and a sense of "belonging to the team" (Melchior, Cohen et al. 2005). Through gradual preparation, students develop the skills and confidence needed to present formally at high visibility events in front of top-tier venture capitalists and expert programmers. We gradually introduce computer programming concepts to the girls, moving from visual to text-based programming. In the basic Technovation Challenge course they use App Inventor, a visual, block-based programming tool that is built upon Scratch (Peppler and Kafai 2007; Resnick 2008), Logo (Papert 1993), LogoBlocks (Begel 1996) and EToys (Resnick, Rusk et al. 1998). Continuing students will be given the opportunity to participate in advanced Technovation Challenge Courses and develop more sophisticated applications using Scratch and Python (Utting, Cooper et al. 2010). At the end of the nine weeks students will have the opportunity to participate in a "hackathon" session where they can collaborate with expert programmers and developers and take their prototypes to completion. "Low Floor, High Ceiling" A project design challenge is to find the right balance between having a "low floor" that makes it easy for new students to get started and a "high ceiling" that allows returning students to develop increasingly sophisticated projects (Resnick and Silverman 2005; Utting, Cooper et al. 2010). Both Scratch and Python are technologies and tools that support a wide range of explorations and outcomes. The advanced Technovation Challenge Courses will equip students with the skills to use specific tools and will then provide them with the intellectual space to develop solutions that connect with their own interests and passions. We are getting ready to conduct six Technovation Challenge programs in the San Francisco Bay Area, Los Angeles and New York City this coming spring, reaching out to more than 300 high school girls. And we hope they will change the world! Begel, A. (1996). LogoBlocks: A Graphical Programming Language for Interacting with the World., MIT Media Lab. Bennett, D. and C. Brunner (2000). The role of gender in the design of electronic learning environments for children. . New York, EDC Center for Children and Technology. Bennett, D., T. Meade, et al. (2005). Alternative pathways into computer science: Investigation of narrative-bound interactive learning environments for teaching girls programming. . New York City, EDC Center for Children and Technology. .
Berg, V. L. (2004). Getting more women into computer science and engineering Strategies of Inclusion: Gender and the Information Society, Information Society Technologies. Bers, M. (2007). Engineers and storytellers: using robotic manipulatives to develop technological fluency in early childhood. Contemporary Perspectives on Science and Technology in Early Childhood Education. N. S. Olivia and B. Spodek. Greenwich, Information Age Publishers. Blum, L. (2001). Women in Computer Science: The Carnegie Mellon Experience, Carnegie Mellon University. Brunner, C. (2008). Games and technological desire: Another decade. Beyond Barbie and Mortal Kombat: New perspectives on gender and gaming. Y. B. Kafai, C. Heeter, J. Denner and J. Y. Sun. Cambridge, MA, MIT Press. Brunner, C. (2008). Girl games and technological desire. . From Barbie To Mortal Kombat: Gender and computer games - 10 years later. J. Cassell and H. Jenkins. Cambridge, MA, MIT Press. Brunner, C. and D. Bennett (2002). The feminization of technology. . Ghosts in the machine: Women's voices in research with technology. N. Yelland and A. Rubin. New York, Peter Lang Publishing, Inc: 71-96. Brunner, C., D. Bennett, et al. (1998). Girl games and technological desire. From Barbie To Mortal Kombat: Gender and computer games. J. Cassell and H. Jenkins. Cambridge, MA, MIT Press: 72-88. Brunner, C. and M. Honey (1992). Gender and technology, Concord, MA: The National Coalition of Girls' Schools., Math and science for girls: The complete proceedings. Brunner, C. and M. Honey (1995). Gender and the technological imagination. . Keynote Presentation at the 1995 Girls & Technology Conference at Wellesley College. , Concord, MA: the National Coalition of Girls' Schools. Dede, C. (2009) "Comparing Frameworks for "21st Century Skills"." Dweck, C. (2007). Mindset: The new psychology of success. New York, Ballantine Books. Faulkner, W. (2004). STRATEGIES OF INCLUSION: Gender and the Information Society. Edinburgh, STRATEGIES OF INCLUSION: Gender and the Information Society. Good, C., J. Aronson, et al. (2003). "Improving adolescents' standardized test performance: An intervention to reduce the effects of stereotype threat." Applied Developmental Psychology 24: 645-662. Good, C., A. Rattan, et al. (2009). Why do women opt out? Sense of belonging and women's representation in mathematics., Baruch College, Stanford University. Goode, J., R. Estrella, et al. (2006). Lost in translation: Gender and high school computer science. Women in IT: Reasons on the Underrepresentation J. M. Cohoon and W. Aspray. Cambridge, MA, The MIT Press: 89-114. Gras-Velazquez, A., A. Joyce, et al. (2009). Women and ICT: Why are girls still not attracted to ICT studies and careers?, CISCO. Halpern, D. F., J. Aronson, et al. (2007). Encouraging Girls in Math and Science, IES Practice Guide, National Center for Education Research, Institute of Education Sciences. Hewitt, E. S. N. M. (1997). Talking about leaving: why undergraduates leave the sciences Boulder, CO, Westview Press. Hill, C., C. Corbett, et al. (2010). Why So Few? Women in Science, Technology, Engineering, and Mathematics, American Association of University Women. Karoly, L. A. and C. Panis (2004). The 21st Century at Work: Forces Shaping the Future Workforce and Workplace in the United States. Santa Monica, CA, RAND Corporation. Kelleher, C. and R. Pausch (2005). "Lowering the barriers to programming: a taxonomy of programming environments and languages for novice programmers." ACM Computing Surveys 37(2): 88-137. Lacey, T. A. and B. Wright (2009). "Occupational employment projections to 2018." Monthly Labor Review 132(11): 82-123. Lareau, A. (2003). Unequal Childhoods: Class, Race, and Family Life University of California Press. Maloney, J., K. Peppler, et al. (2008). Programming by Choice: Urban Youth Learning Programming with Scratch. SIGCSE'08, Portland, Oregon, USA. Margolis, J. and A. Fisher (2002). Unlocking the Clubhouse: Women in Computing Massachussetts, MIT Press. Margolis, J., A. Fisher, et al. (2002). Caring about connections: Gender and computing. Pittsburgh, PA, Carnegie Mellon University, School of Computer Science. Meerbaum-Salant, O., M. Armoni, et al. (2010). Learning Computer Science Concepts with Scratch. Proceedings of the Sixth international workshop on Computing education research. Aarhus, Denmark. Melchior, A., F. Cohen, et al. (2005). An Evaluation of the F1RST Robotics Competition Participant and Institutional Impacts, Brandeis University, MA. Papert, S. (1993). Mindstorms: Children, Computers, And Powerful Ideas. New York, Basic Books. Peppler, K. and Y. B. Kafai (2007). "From SuperGoo to Scratch: exploring creative digital media production in informal learning." Learning, Media, and Technology 32(2): 149-166. Pezalla-Granlund, N., N. Rusk, et al. (2005). Rethinking Robotics: Learning through Creative Engineering. Association of Science-Technology Centers. Plant, E. A., A. L. Baylor, et al. (2009). "Changing middle-school students' attitudes and performance regarding engineering with computer-based social models." Computers and Education 53: 209-215. Radenski, A. (2006). "Python First": A Lab-Based Digital Introduction to Computer Science. ITiCSE'06, Bologna, Italy. Resnick, M. (2002). Rethinking learning in the digital age. The global information technology report: Readiness for the networked world. G. Kirkham, Oxford University Press. Resnick, M. (2008). Sowing the seeds for a more creative society. Learning & Leading with Technology ISTE (International Society for Technology in Education). Resnick, M., N. Rusk, et al. (1998). Computer Clubhouse: Technological fluency in the inner city. High technology and low-income communities. D. Schon, B. Sanyal and W. Mitchell. Cambridge, MA, MIT Press. Resnick, M. and B. Silverman (2005) "Some Reflections on Designing Construction Kits for Kids." Rusk, N., M. Resnick, et al. (2007). "New Pathways into Robotics: Strategies for Broadening Participation." Journal of Science Education and Technology 17(1): 59-69. Rusli, E. (2010) "Fixing Silicon Valley's Gender Gap One Pitch At A Time." TechCrunch. Singh, K., K. R. Allen, et al. (2007). "Women in computer-related majors: A critical synthesis of research and theory from 1994-2005." Review of Educational Research 77(4): 500-533. Turbak, F. and R. Berg (2002). "Robotic Design Studio: Exploring the Big Ideas of Engineering in a Liberal Arts Environment." Journal of Science Education and Technology 11(3): 237-253. Utting, I., S. Cooper, et al. (2010). "Alice, Greenfoot, and Scratch - A Discussion." ACM Transactions on Computing Education 10(4). Williams, L. (2006). "Debunking the Nerd Stereotype with Pair Programming." Computer 39(5): 83-85.